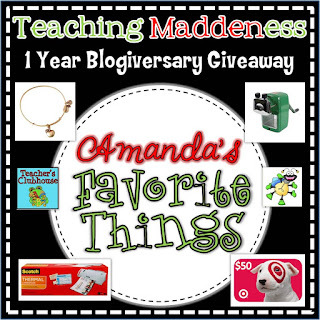 If you haven't entered my giveaway, today is the day!! I will announce the SIX winners tomorrow! And, if you HAVE already entered, remember that you can ENTER DAILY by "sharing"!! How CUTE is that?? It's amazing to think that we've been creating and sharing our resources with teachers for SIX YEARS!! We're so glad that so many other teachers are sharing their talent now and are glad that we joined the TpT community this year! Speaking of TpT, our Week 5 FREEBIE is also up today! 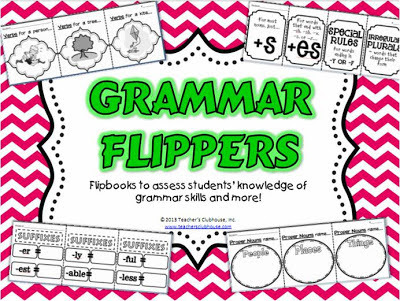 Our Reading Strategy Flippers were a big hit last year, so we have created Grammar Flippers - a set of 23 flipbooks to assess students' knowledge of parts of speech, compound words, possessives, and MUCH MORE!! Next week's freebie finale is already in the works...we're going to end it with a mega freebie that has been on my to-do list for a long while! These are great! Thanks for the amazing freebie:) Our district is pushing foldables and cubes during instruction so I will be using these a lot this year!! These will be so helpful this year!! Thank you! Love the Grammar Flippers, thank you so much for sharing. Last year was the first year I used flip books. These look great. Thank you for sharing.